(b. 1972 in Ottawa, Canada; based in Kamloops, British Columbia) Ecology, landscape, ideas of the North, the daily lives of Indigenous people, religion, and apocalyptic language come together in this epic work. 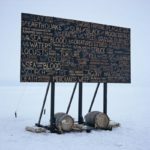 In 2010, the artist hand routed text from the Book of Revelation on a huge rectangular cedar sign that he transported from Vancouver to Tuktoyaktuk in Canada and set upon the frozen ice of the Northwest Passage. Schmidt hoped that, once the season changed, the sign would float warning of the potential disaster should the North become the site of massive oil and natural gas extraction. 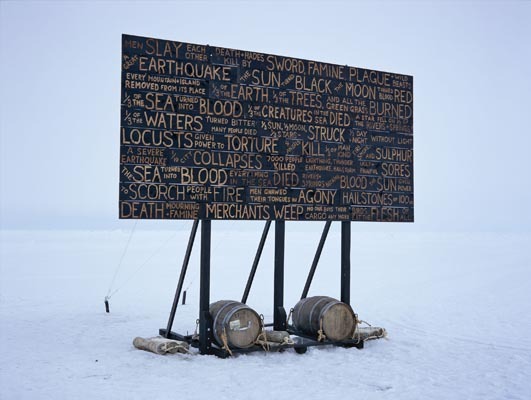 Schmidt videotaped the sign’s installation and his return the following year, when he conducted a massive sea and air search to find the marker. He was unsuccessful. All that remains is a photograph, video, and watercolors.